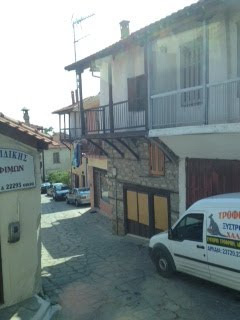 Adrian and I are currently at Ouranoupoli, the town at the edge of the Holy Mountain. To make a long story short, we missed the boat to Mount Athos due to poor communication. We'll catch the first boat tomorrow at 6:30 am. Today we are relaxing on the beach. On Sunday at church, I met a woman named Anastasia who was excited we were going to Mount Athos. She lives in Thessaloniki and wanted to go home this week and didn't want to go by herself. She wanted take the train with us. After several phone calls, it just wasn't working out. However, just as the train was about to leave, I got a very excited phone call. The ensuing scene was so dramatic, it was like a movie. She was at the station to give me a list of names for the monks to pray for and a donation for the monastery. She was yelling to me, her friends were yelling at her, and the security guards were pulling her away. Standing in the doorway, I grabbed the list and money as the train was pulling away. Thanks to earplugs, a mask, and Advil PM, I slept most of the ride. Adrian was not so fortunate. There were bright lights on all night, the chairs were uncomfortable, and people were snoring loudly. 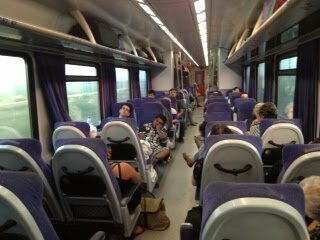 The train itself was awful overall. One or several of these factors would be tolerable, but the overall atmosphere was not ideal. Combined with the state of the bathrooms, which Panagiotis described most accurately as, "Eat a big lunch, skip dinner, and take care of business before the train. You don't want to have to use the WC on the train. People are so disrespectful." When we got to Thessaloniki, we caught a cab for €10 to the bus station where we at breakfast and waited until the first bus at 9:00 am. The three hour bus trip was quite surreal. Instead of bright lights, there was now loud bouzouki music. The driver talked on his cell phone for most of the drive and had the loudest conversation in the bus. Besides that, of course, no sleep could be had on the hairpin turns or abrupt breaks on narrow steers through small mountain villages. We arrived in Ouranopouli at 12:30 where we were assured a boat would be waiting for us. The man at the pilgrim's bureau was annoyed...the last boat left hours ago. "Get a hotel and catch the boat tomorrow at 6:30 am." Adrian and I found the dock and figured things out. We met a man our age named Alexandros who was heading to Donkey Island where he was going to rough it for a week. We stopped by a beautiful chapel to St Nicholas on the dock. 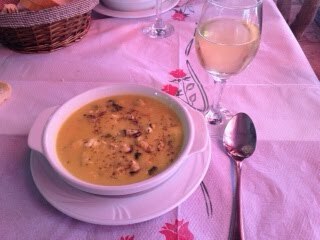 We ate lunch at a taverna. We had mussels saganaki (not in tomato sauce but still good). We used the WIFI to locate a hotel through booking.com. 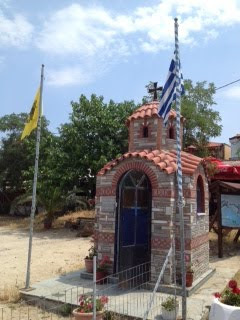 We found Theopisti which is close to the beach and dock, air conditioned and has WIFI for €35. Sweet. 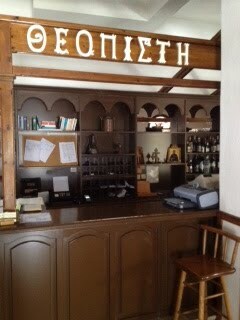 Note icons behind the counter of the hotel (which doubles as a bar). There are icons and chapels everywhere here in northern Greece (much more than Athens)... in the cab, on the bus, at the bus station, in every store... everywhere. Adrian is resting and I am writing. More updates after the beach (and European swimwear shopping). We can see the Holy Mountain... we just can't touch it.